Qurban Bibi is a 39 year old single woman from a poor family in Mastuj district in Chitral. She lost her father at a very young age and took on the responsibility of supporting eleven members of her family. Upon hearing about a training workshop near her house, she participated in the 10-day Business Management course conducted by the FMFB’s Area Office in Chitral. The trainees were also told about the FMFB-P’s easy to access services compared to other financial institutions. Encouraged by the information, Qurban Bibi formed a group in her community to access a loan from the FMFB-P. It was not easy for her to own a business and access local markets in a conservative and patriarchal community. However, the FMFB-P gave her the support by providing her with the skills and knowledge to start up and manage her own business. 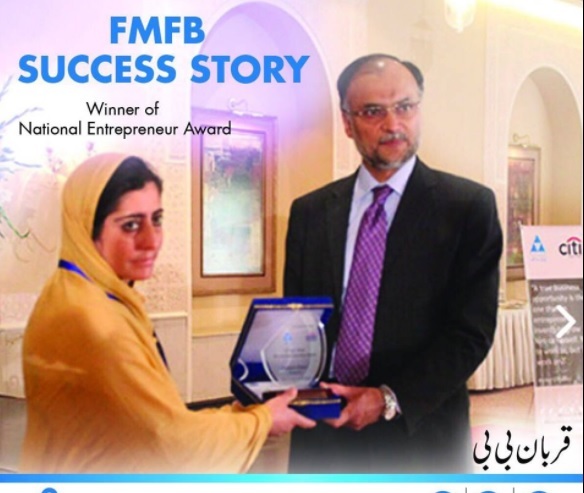 As a result of her hard work, Qurban Bibi won the Citi-PPAF’s “Best National Micro-Entrepreneur Award” for 2013 in the female category. She took two loans from FMFB-P to start up a beauty parlour and another small enterprise providing sewing, embroidery, printing and photography services to the community. She currently employs eight women and earns around PKR 60,000 in a month. She also trains women in the community on knitting, sewing, hand-crafts, decoration, photography, dyeing and grooming skills. Qurban Bibi also gives interest-free loans, free trainings to women to establish their own business, and discounts on services to local community members.